The statement, which was accompanied by a text graphic that reads “THE BEST APOLOGY IS CHANGED BEHAVIOR,” has been extremely well received by the public. It certainly comes across as sincere, and doesn’t seem to be watered down by her PR people or her lawyer. I honestly believe that some issues no matter how great and important are truly only a part of our awareness once we are personally effected by them. For me….what happened this week is that issue. I could easily join in with the chorus saying “you’re right, it could be any of us” but it shouldn’t be any of us. EVER! To all of you who wrote me with pain in their hearts about how drinking and driving has had a negative impact on them and their families, I hear you. Thank you. I make this promise to each one of you with your messages in my heart…. I am committed to this cause and hope to effect a positive change and dialogue. You don’t have to believe me with these words, but I hope over time you will see through my actions. 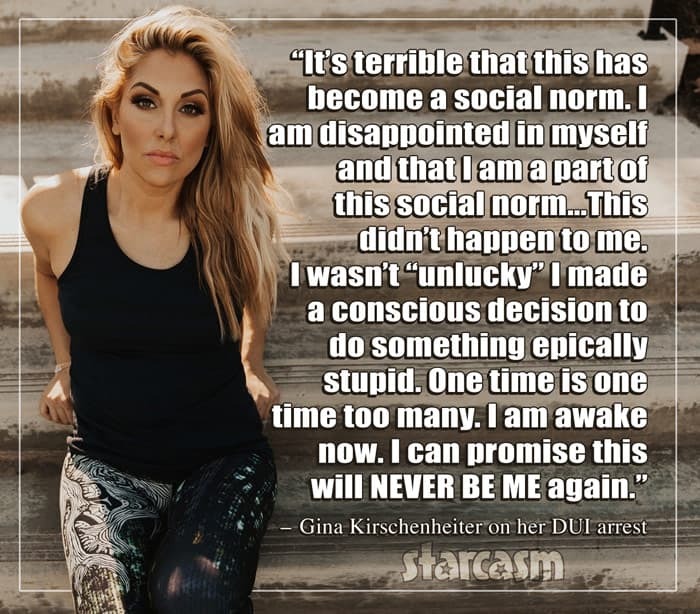 Gina is currently going through a divorce from her husband Matt Kirschenheiter, with whom she shares three children: Nicholas (6), Sienna (4) and Luca (3). Gina’s next scheduled court date for the DUI is February 28.